Megastar Amitabh Bachchan has finished the shoot of his forthcoming movie “Pink” and bade an emotional farewell to the team. The thriller directed by Bengali filmmaker Aniruddha Roy Chowdhury and also stars “Baby” actress Taapsee Pannu. It is set for a September 16 release. Bachchan, 73, plays a lawyer in the film, which is produced by his frequent collaborator, Shoojit Sircar. 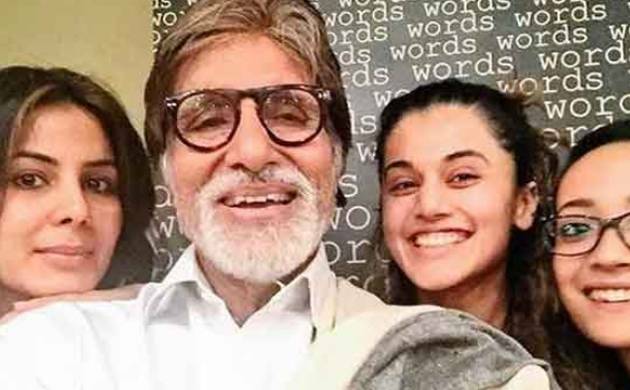 “You sit and work with them.. listen to them as they debate suggest involve themselves in your work and theirs .. you share space of character and its enactment.. their emotions and laughter.. their knowledge and maturity on worldly matters.. you seek whether they miss your presence each day, and you theirs,” Bachchan wrote on his blog. Bachchan will also be seen in Sujoy Ghosh’s thriller “TE3N”, which stars Vidya Balan and Nawazuddin Siddiqui as well. The film will release on June 10.